Discussion in 'Apple' started by Wolf, May 2, 2015. Apple has officially announced the date of its annual WWDC event, which this year will be taking place on June 8 at the Moscone Centre in San Franciso, California. As usual, Apple will be using the event to reveal and showcase some of its plans for iOS 9 for its mobiles and tablets and the next iteration of OS X for Macs. Last year the company showed off a lot of crossover between the two platforms and this looks set to continue. We also expect to see more about connected smart devices, appliances and vehicles; the internet of things, as it's understood Apple has big plans here. Apple is also believed to be gearing up to reveal more about its plans for a Music service, following its acquisition of Beats Audio. This will likely form a focal point of the next iPhone along with otherkey features from iOs 9, and we're also hoping to hear about more integration and features from the Apple Watch, and possibly details of a rollout of Apple Pay outside the US. Apple Music looks like it'll rock. On-demand music, it's own 24-7 radio (with DJs), and everything that was included in iTunes Radio curated by experts. Featuring on-demand content, curated playlists, and a new global always-on radio station dubbed "Beats One," Apple Music is a subscription service that aims to redefine how people discover and listen to music for $9.99 a month, or $14.99 for six family members. It launches on June 30 for Apple devices and Windows, but will also come to Android and Apple TV this fall. Pitching it as a "revolutionary music service," Apple executive Jimmy Iovine said at WWDC 2015 on Monday that the new Apple Music will change the way users listen to content and interact with artists. A key component is human-curated playlists, which Iovine said offer much better quality than any algorithm could ever attempt. Part of Apple Music is a 24/7 global radio station that is the brainchild of Nine Inch Nails frontman Trent Reznor. Featuring DJs broadcasting from three cities, "Beats One" will stream from within the Apple Music app, and will be available to listen for free, even without an Apple Music subscription. Just heard this from another article, if it's on iTunes, it's available to stream on Apple Music. Even the Beatles, even Metallica. Here a breakdown of everything new in the iOS 9 software. 1 radio station playing what type of music? $10 is more than I am willing to pay for streaming music. My max is $4/month for Slacker and only because I can store some on the device for listening when on the subway outside of any internet service. Doesn't matter anyways as I have no doubt this will not be available in Canada. Something tells me that this iOS will consume battery faster than ever. Will they fix any bugs or just add about 1000 more? Probably both, I saw this tweet earlier today. Supposedly how much memory iOS 9 installation will take. 1 radio station playing what type of music? $10 is more than I am willing to pay for streaming music. Streaming radio, live radio, and on demand. My max is $4/month for Slacker and only because I can store some on the device for listening when on the subway outside of any internet service.
" 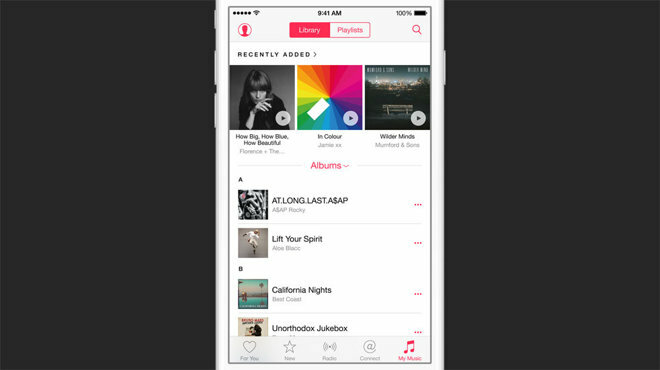 Apple Music will be available starting on June 30 in over 100 countries." What is the difference between streaming radio and live radio? I assumed all their radio is streamed. One channel implies one choice of music. Do they list the countries? I have no desire for on demand. It makes any service more expensive (in the $10/month range). So thanx for the clarification, still outside my price range.